Contrary to popular belief, Starfleet’s primary mission is not a military one. Despite its military ranks and procedures, its frequent space battles, and its ships which carry enough firepower to bake the crust of a planet, Starfleet is devoted primarily to the peaceful, scientific exploration of space and the policing of Federation space lanes. However, there are times when military intervention on a planet becomes necessary, and when those times come, the Federation maintains an elite force of soldiers - Starfleet Marines. Fleet personnel serve a wide variety of purposes, diplomatic as well as scientific. Starfleet Marines serve a narrower purpose - reconnaissance, armed support, and of course combat if diplomacy fails. Even when forgotten, the Starfleet Marine Corps is always hard at work upholding the ideals of the Federation while guarding it from any adversary that may present itself. In true military fashion, officers of the Marine Corps place the lives of others before their own, ready to sacrifice anything for their government. 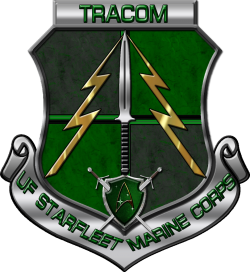 The organization of the United Federation Starfleet Marines is formed along the lines of the different real world Marine Corps organizations but mostly follows the structure, customs, courtesies and traditions of the United States Marine Corps of the 21st century. The Commandant of the United Starfleet Marine Corps reports directly to the Commander-in-Chief UF Starfleet. 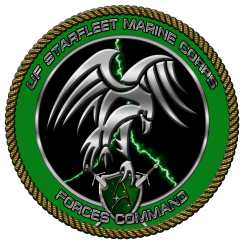 The Chain of Command (CoC) exists to allow communications within the United Federation Starfleet Marine Corps to flow both down from the General Staff at the top of the Chain, and down that chain to every individual Marines. 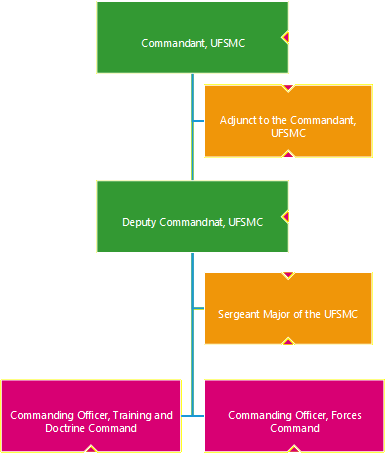 To fully explain how the chain of command is related to and both effects and is affected by the Individual Marine Member we will take a look at the Chain of Command from the top for the Marines being the General Staff down to the individual Marine Member. The Commandant of the United Federation Starfleet Marine Corps is responsible for all Aspects of the Corps. The Commandant is the Commanding Officer of the United Federation Starfleet Marine Corps and is the Supervisor of all functions and undertakings of the United Federation Starfleet Marine Corps. The Commandant serves at the Discretion of the Commander in Chief of UFS Starfleet and is considered a Joint Chief of Staff of the United Federation Starfleet. The Commandant of the United Federation Starfleet Marine Corps is commonly called the Commandant or 'Dant for short. The Deputy Commandant of the United Federation Starfleet Marine Corps is the Executive Officer of United Federation Starfleet Marine Corps. The Deputy Commandant of the United Federation Starfleet has the exact same qualification requirements as the Commandant of the United Federation Starfleet Marine Corps and has the additional responsibility to take over the United Federation Starfleet Marine Corps in the event that the Commandant becomes unable to perform his duties as Commandant of the United Federation Starfleet Marine Corp. The Deputy Commandant is appointed by the Commandant of the United Federation Starfleet Marine Corps. The Deputy Commandant of the United Federation Starfleet Marine Corp is commonly called the Deputy Commandant or Dep'Dant for short. The Commanding Officer, Forces Command is the Commanding Officer of the Forces Command of the United Federation Starfleet Marine Corps which is responsible for the Day to Day operations of all 20 Marine Divisions and the Marine Detachments assigned under each of those Divisions. The Commanding Officer, Forces Command is responsible for the membership of the Marine Corps and works with the UFS Database. The Commanding Officer, Forces Command serves at the discretion of the Commandant of the United Federation Starfleet Marine Corp. The Commanding Officer, Forces Command is commonly called the COFORCECOM. The Commanding Officer, Training and Doctrine Command is responsible for the Education and Certification of all marines including training, induction of new Marines, and certification of Marines in the Military Occupational Specialities. The Commanding Officer, Training and Doctrine Command also serves as the Commandant of the United Federation Starfleet Marine Corp Academy. The Commanding Officer, Training and Doctrine Command is appointed by the Commandant of the United Federation Starfleet Marine Corps. The Commanding Officer, Training and Doctrine Command is commonly called the COTRACOM. The Sergeant Major of the Marine Corps is the Senior Enlisted member of the Corps. The Sergeant Major is responsible for providing leadership to the Enlisted Marines as well as to support the other members of the General Staff. The Sergeant Major of the Marine Corps serves at the discretion of the Commandant of the Marine Corps. Forces Command (FORCECOM) is charged with the administration of the units of the Corp. It is headed by the Commanding Officer, Forces Command (COFORCECOM). All Marine OICs report to the COFORCECOM via the Monthly Status Report (MSR). The MSR that reaches the COFORCECOM starts from the Detachment and Task Force level. Each Detachment or Expeditionary Force OIC sends an MSR to their Ship CO and Division or Regiment OIC. If in place, Regimental OICs then forward compiled reports to Division OIC. The Division OICs compile their reports to the COFORCECOM to report to the Commandant. FORCECOM also oversees approval of all new units, as well as disbanding of all defunct. Training and Doctrine Command (TRACOM) is charged with the development and update of all Marine Training Manuals, Classes and MOS Certifications. Commanding Officer, Training and Doctrine Command also serves as the Commandant of the United Federation Starfleet Marine Training Academy. The Marine Detachment, MARDET for short, is the smallest organizational unit in the United Federation Starfleet Marine Corp. A Marine Detachments is assigned to each Division Headquarter and every Ship of the Line in each Sector. Marine Detachments are numbered with either a 3-digit or 4-digit number where the first one or two digits of that number correspond to the Sector/Division Number and the last two digits are assigned by FORCECOM when the Marine Detachment is created. For Example, the Marine Detachment aboard the USS Rodger Young in Sector 13 requested the Number 1376 from FORCECOM and it was granted to them. The Marine Detachment also does not have a specific size for the purposes of the Detachment's Role Play. Marine Detachments can be any configuration of Light Infantry, Powered Infantry, and Aerospace from any size from a full reinforced battalion down to a single Infantry Squad or Aerospace Flight. As an Example the 1376th Marine Battalion is the Marine Detachment aboard the USS Rodger Young and it consists of two full companies of Light Infantry, one company of Powered Infantry, and a squadron of aerospace fighters to provide air support. The final element in the United Federation Starfleet Marine Corp is the individual Marine. After Graduation from the United Federation Marine Training Academy, the individual Marine is assigned the Military Operational Specialization of Rifleman and assigned to a Marine Detachment. 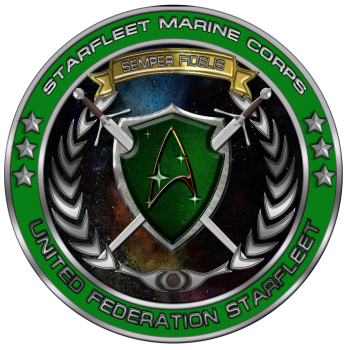 More information on Military Operational Specializations and the United Federation Starfleet Marine Training Academy can be found here. In the Earth year 2063, following First Contact with the Vulcans, several powerful surviving Earth governments merged into an organization called United Earth. Among the first actions taken by this group was to create three organizations for the defense and reconstruction of Earth; the three organizations being, United Earth Starfleet, United Earth Space Probe Agency, and the Military Assault Command Operations. The Military Assault Command Operations, or MACO, was a pure military group created from some of the militaries of the countries that joined the United Earth. There were however several hold outs, citing that not all countries have joined the United Earth and thus were still needed. However, in actuality they were fighting to keep their individuality, and history that they have fought so hard during World War III to keep. In the year 2150 the last independent countries join the United Earth, following this the United Earth forced all remaining earth bound militaries into one of the three organizations. The final independent military organization to disband was the United States Marine Corp, on November 10, 2150 on their three hundred and seventy fifth birthday, the last Commandant General Robert Casey, gave a heartfelt and rousing speech on the Marines new battlefield... space. As with most earth militaries they were absorbed into the United Earth’s three organizations, the majority of the marines that did not retire or resign joined the Military Assault Command Operations. This brought a strong and organized force into the MACO as it was poorly organized and badly managed by the Commander of MACO, General Henry Oliver. As General Casey filed his retirement, he was offered and accepted command of MACO to organize it into a real and able force for Earth. In 2154 following the Romulan Marauder Incident, General Casey knew there would be war with the Romulans and began readying the MACO for it. In 2155 Following the foundation of the Coalition of Planets, General Casey took two historic trips. For Six months he was on Vulcan observing and learning from the Vulcan High Command’s Special Forces. General Casey then travelled to Andor as a guest of Commander Shran, with whom we formed a strong friendship with, to observe the training and military capabilities of the Imperial Guard. He watched closely and learned well, taking this information back to Earth to be implemented into MACO training. MACO training now added a strong starship element were as before they were focused on only fixed locations. 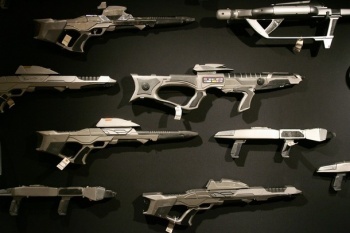 MACO troops could now act as a second security force on Starfleet ships if requested by Starfleet Command. This training would come to be of great assistance in 2156 when the Romulan Star Empire and the United Earth declared war. When the war broke out General Casey was quickly recognized as a strategic asset in the United Earth due to the face he has been preparing for this war for several years. MACO detachments became standard on all Starfleet ships and stations that could support them in order to repel Romulan boarding actions, which we found out later was useless because Romulans don’t take prisoners and never once boarded a Starfleet ship, at least not one that ever survived to report it. In 2157, by order of the United Earth government, General Casey was promoted to Field Marshal for his extensive work in fortifying United Earth installations to repel any attempts at invasion; he would be the only MACO to achieve this rank. In 2160 the Earth – Romulan War ended, no United Earth Planet fell to Romulan forces, but the death toll was still extremely high. Military Assault Command Operations teams did not play a significant part in the war because the Romulans never penetrated far enough into Earth Space to encounter them in significant numbers. In 2161 the United Foundation of Planets was founded and the United Earth Starfleet and Military Assault Command Operations would be absorbed into this new group. As Starfleet became a defensive and exploratory organization, the members of MACO were given the choice between converting their commissions and enlistments over to Starfleet Security or taking early retirement. In 2373 when the Cardassian Union officially joined the Dominion and Chancellor Gowron re-entered the Klingon Empire into the Khitomer Accords, Starfleet determined that a war with the Dominion was inevitable and that war was going to take place on ground installations and planets as well as between starships. To answer this threat, the Federation Council voted to create two now divisions within Starfleet. The first division was to focus on Ground Combat and the close air and space support that would be needed for those ground forces. The Federation Council tasked Admiral Kathryn Maxwell in creating this new Ground Forces Division. Since Admiral Maxwell was an avid student of military history, she chose to call the new division the Starfleet Marines to honor the history of the United States Marine Corps which served with its then naval counterpart the United States Navy. The second division was conceived to fill in the role of protecting the Federation from advanced hostile alien threats wither it was on the ground or in space. Admiral Sanstrom Laxness was tasked with creating this division, and following the lead set by his counterpart Admiral Maxwell, Admiral Laxness chose to reactive the name of the old United Earth Organization that helped Starfleet defeat the Xindi and Romulans before the United Federation of Planets was created. He called the new division the Military Assault Command Operations, and like the new Starfleet Marine Corps, the MACO was a part of the Starfleet Elite Joint Operations Division. Late in 2373, as the Dominion Fleet pushed Starfleet back deep into Federation space, Admiral, now General, Maxwell deployed the Second Marine Division to the Federation starbases in orbit around on many of the Federation member worlds, several including Betazed refused this saying it would disrupt their populations. The Dominion was able to gain a foot hold in the Bolian System in the early throws of the war. They were also able to push into the Vulcan System, attempts to invade one of the outer planets was repulsed by the forces of the Second Marine Division. Following the fight on the surface Starfleet was able to the Dominion back out of the system. Starfleet is able to retake Deep Space Nine. In 2374 in the Kalandra Sector the Dominion pushed up all their offensive operations and had nearly daily attacks on Starfleet and the Marines stationed on Chudala III, Moreska IV and Zhamur II. This all came to a head when the Dominion attacked and conquered Betazed. All Marine and Starfleet forces had to fall back out of the system to avoid destruction. This was one of the greatest strategic disasters in the war as now the Dominion now had a position to launch attacks into the core of the Federation. The Dominion launched a second invasion of the Vulcanis Sector, they took hold of three moons on the outer planet, an attempt to invade Vulcan’s moon was repelled by Marine Forces. As this fight was occurring the Dominion launched an invasion of Benzar. The Dominion breached the defense lines and made it to the planet. Despite their best efforts the 23rd Marine Battalion was unable to repel the invasion, and fought to the last. They inflected massive casualties on the Dominion, destroying 3 Jem’Hadar Divisions and the Cardassian 8th and 12th Orders. With the success of their attack on Benzar the Dominion attempted to again take Vulcan. Starfleet was able to rout the enemy fleet and the 27th and 24th Marine Battalions retook the outer moons conquered by the Dominion. The Dominion attempted to push farther into the Bolian system but stiff resistance from Starfleet and the 251st and 240th Marine Battalions kept the Dominion at bay. Starfleet decided it was time to go on the offensive and invaded the Chin’Toka system. The 212th, 218th and 233rd Marine Battalions took part in the landings. Starfleet and Romulan forces forced the Dominion out of the Bolian system, aided by the 240th Marine Battalion. In 2375 the Breen joined the Dominion and attacked Earth directly. The entire Breen attack force was destroyed but the damage was done, Earth itself was attacked, the blow to moral was immense. 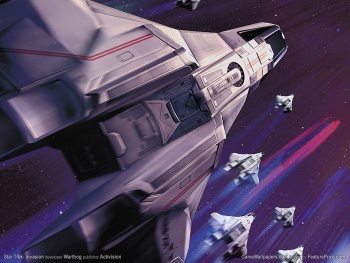 Following the Dominion counterattack in the Chin’Toka system the 12th, 18th and 33rd Marine Battalions were able to evacuate and fall back to Federation Space. Starfleet mustered a fleet to again attempt to free Betazed. Following a brutal battle in space Starfleet was able to retake the system; the 36th and 42nd Marine Battalions landed and were able to secure the capital in several hours. Following the Battle of Cardassia the 24th and 27th Marine Battalions were stationed on Cardassia Prime as military garrison. In the aftermath of the war it was decided the Marine Battalions would remain garrisoned the starbases in orbit around the member worlds due to the Federation’s losses and weakened state.